We live in a high-resolution world—our phones have been shooting HD video for years, and 4K-capable cameras are finally within reach of regular consumers. 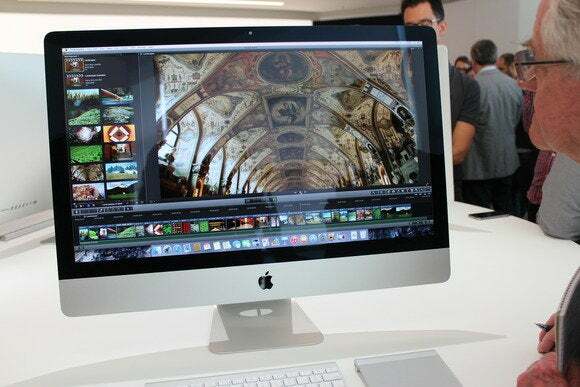 And now Apple’s new iMac with Retina 5K display will let you push those pixels with maximum efficiency. With a native resolution of 5120x2880 pixels, this iMac shows a ridiculous amount of detail in everything you look at. 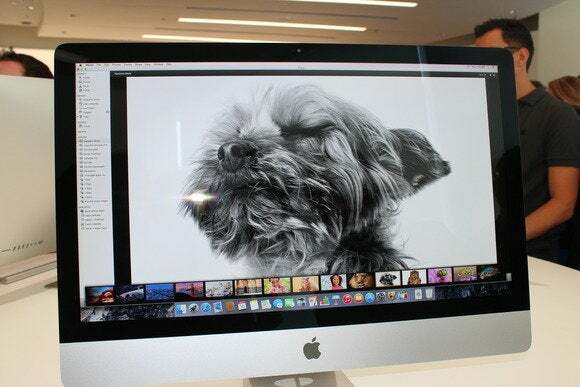 In the hands-on area at Apple HQ, I saw the new 27-inch iMac editing 4K video in pixel-for-pixel resolution, with enough room left on the screen for all of Final Cut Pro’s toolbars and controls. Final Cut Pro wasn’t even running full screen—in the photo below, notice the Dock still hogging some space along the bottom. Not bad. Editing 4K video in full resolution, with plenty of room for Final Cut Pro's tools, and even Yosemite's Dock along the bottom. I also saw some 4K photos displayed at full-resolution in iPhoto. You can see individual strands of fur on close-up puppy portraits, and the hair-thin barbs on the feathers of an owl. If you take detailed photos of cities, beaches, and crowds, you’ll appreciate being able to fit so much on the screen at per-pixel accuracy. Zooming in and out was quick and smooth thanks to the base model’s 3.5GHz quad-core i5 processor. I only got to play with iPhoto and Final Cut briefly, but in that time—and while watching an Apple rep whip through her demos—the dreaded rainbow beach ball was nowhere to be seen. This puppy looks pretty blown away. The iMac’s screen is bright from edge to edge, and shows great color saturation even when looking at it from an angle. Other displays with this kind of resolution depend on two timing controllers, or TCONs—think of a TCON like the brains of the display, sending instructions to the individual pixels. 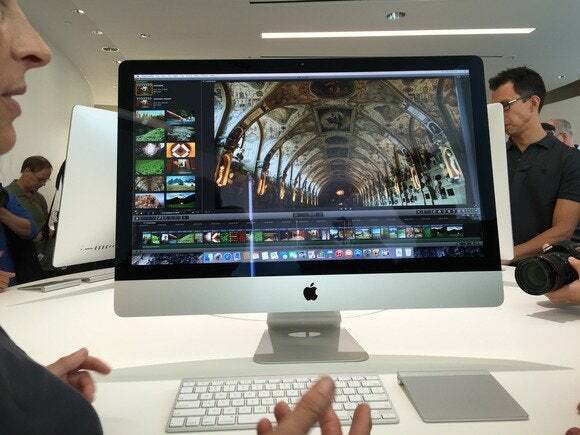 Apple designed its own TCON for this iMac, so a single controller can drive all 14.7 million pixels. If you bought Dell’s 5K monitor, which has the same 5120x2880 resolution, and connected it to your Mac Pro, you’d need two DisplayPort connections for its two TCONs. If this iMac were just a display, you’d only need one connection—but of course it’s a whole computer, so you need zero. Oh, and starting at $2500, that whole computer is the same price as that Dell 5K display, too. At least until Dell is forced to drop its prices to save face. The super-slim iMac body is unchanged, tapering to a 5mm edge. Besides the 5K display, the iMac looks just about the same. The edges still taper to an impossibly thin 5mm, with the guts of the iMac nestled in an elegantly curved bulge behind the display. You get Thunderbolt 2 ports (two of them) instead of the Thunderbolt 1 that appears on the rest of the iMac line. But the rest of the specs are pretty comparable. The display’s the thing here—and after seeing it in person, I’d say that’s enough. The iMac with 5K Retina display is on sale immediately, starting at $2499. We’ll have a full review as soon as we can.